TAO GROUP BLOG TAO NIGHTCLUB LAVO NIGHTCLUB TAO BEACH LAS VEGAS: LMFAO AND CRSVR BOUTIQUE HOST LAVO LABEL JUNKIE WEDNESDAY! LMFAO AND CRSVR BOUTIQUE HOST LAVO LABEL JUNKIE WEDNESDAY! 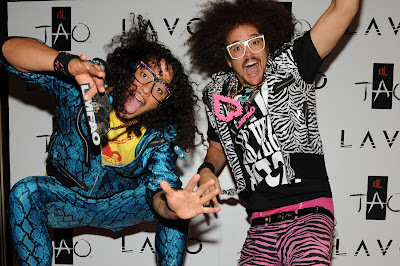 Wednesday night pop group LMFAO kicked off the launch of their Party Rock clothing line at LAVO. Redfoo, Sky Blu and friends first sat down to a dinner of Italian specialties and raspberry mojitos before heading up to the nightclub. Upstairs in the nightclub they took over LAVO’s Label Junkie Wednesdays, with a fashion show of their new line with co-host CRSVR, DJ Vice’s Santa Barbara sneaker boutique.